Create a project using the colors: Lime Green, Yellow, Orange, and Purple. You have TWO WEEKS to play along - Deadline to enter is Friday, October 12, 2018 at Midnight CST. The winners will be announced on the NND blog the following Monday. Debbie Owens subtly creates her background using the challenge colors with Distress Oxide inks on black card stock and the Pumpkin Patch stencil. She then die cuts using the Framework die. 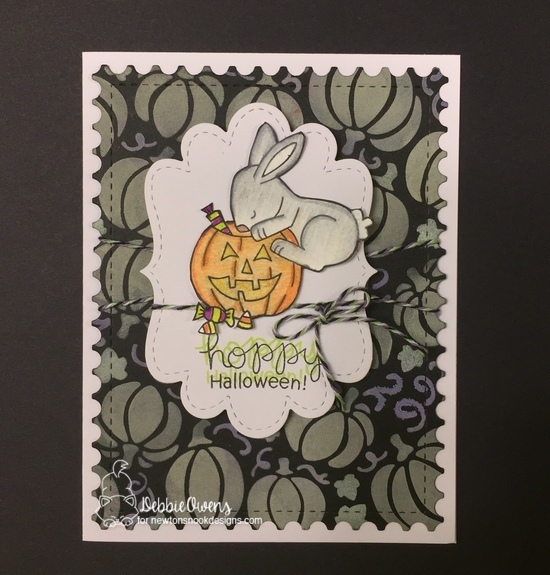 Using colored pencils, she colors that darling candy-loving bunny from the Hoppy Halloween stamp set. She adds twine to finish her card off! Diane Morales creates her bright background by using the challenge colors. She then uses Versamark to stamp the itty-bitty stamps--moon, bone, pumpkin, and stars-- from the Spooky Skeletons stamp set over her background. She then stamps two bats and a flamingo and uses the coordinating die set to cut them out. She stamps the sentiment on a banner. Such a scarily cute card! Emily Lauritzen distresses her background to include a bright, full moon and spooky bats. She die cuts her gray ground using the Land Borders die set. Using the Frames & Flags die set, she creates her frame. 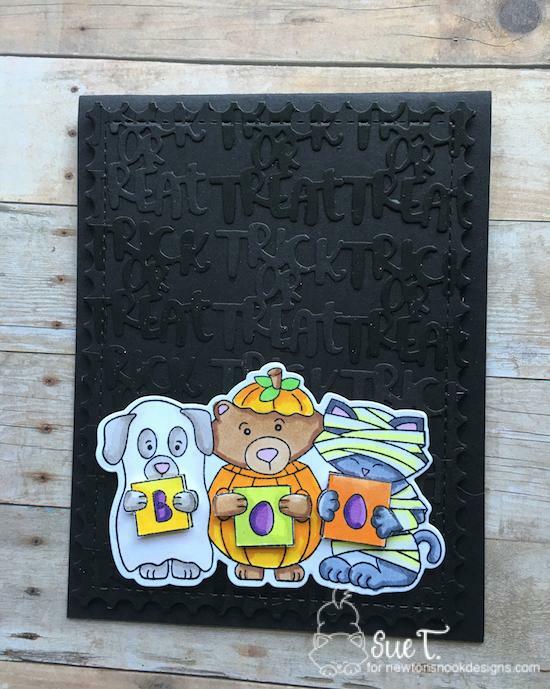 For the main attraction features these darling costumed-critters from the Halloween Trio stamp set. Spook-tacular! 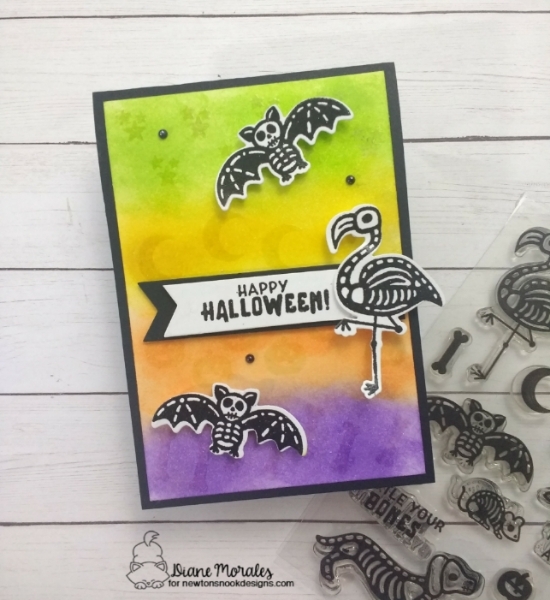 Sue T. creates this fabulous black on black background by repeatedly die cutting the sentiment from the Halloween Trio die set and adhering them onto the black card stock. She then uses the Framework die to create the frame. 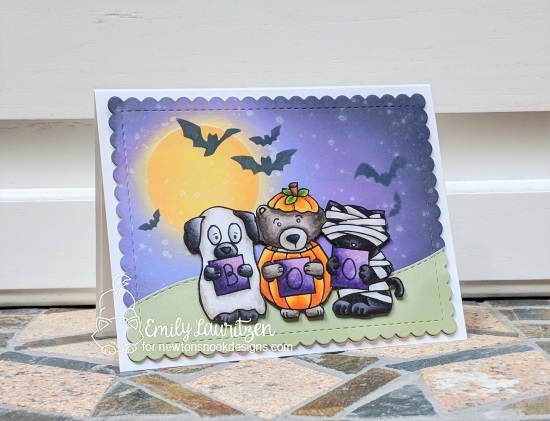 Sues then uses the Halloween Trio stamp set to color these cute critters and cuts them out using the coordinating die set. Fabulous! 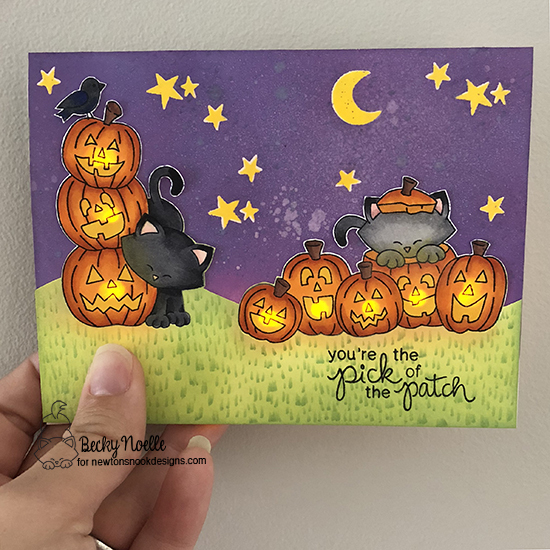 Look at this darling pumpkin patch that Becky Noelle creates! All those pumpkin images are from the Newton's Boo-tiful Night stamp set. She creates a wonderful purple sky with a yellow moon and stars. And did you notice that her pumpkins are all lit up? She uses Chibi lights. Wonderfully done! 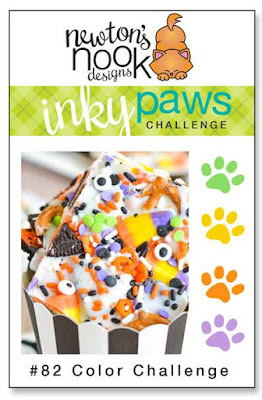 This is my favorite Halloween color combination! Thanks for the fun challenge and fantastic design team inspiration.